We had a nice, long, and very active thunderstorm a couple weekends ago. While we get thunderstorms often, there aren’t too many each year where the lightning is near-continuous for hours. 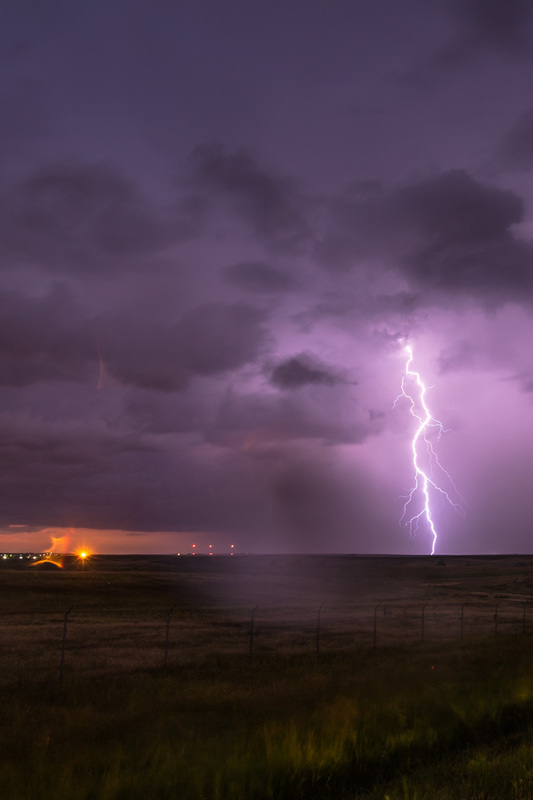 I headed out east on Quebec street, out of Aurora, CO. Out there on the plains, over the scattered hydrocarbon wells, is a particularly active spot for lightning. It always seems to get most intense in this one area, and when the storms peak, lightning flashes are occur nearly continuously. Most of the time the storms are wrapped in rain, and it’s impossible to make out any actual bolts of lightning. This time, I reached my “spot” just as the first couple of thundercells were peaking, and the rain hadn’t quite hit yet. It was quite a show! It wasn’t long after the storm really picked up that the rain it. My gear ended up getting drenched, and the water spots on the lens picked up the light from the periodic passing car, resulting in crazy flares. You might see some funky, warped orange things in some of the images…that’s just water spots refracting headlight. Sin Duda Una Gran Serie, Llena De Dificultada Para Enfocar Los Rayos… Un Saludo. These are amazing shots Jon. What kind of setting do you use to capture the lightning strikes? You must have a fast trigger finger to capture it just as it goes to ground!